When historian Rowan Dorin first stepped onto the Stanford campus in early 2017, he made it a habit to visit Green Library every week to dig through its collection of medieval documents and objects. After a few months, Dorin, an assistant professor of history specializing in medieval Europe, discovered something out of the ordinary. Three leaves of ancient parchment were labeled as a Hebrew translation of text about grammar, but its margins had Latin words like fish, capers and dill. "It looked like some sort of food dictionary," said Dorin about his first impression of the documents. "There didn't seem to be anything grammatical about it." The miscataloged texts turned out to be written in Arabic using Hebrew letters, with Latin and old Spanish notes on the edges. They described the health qualities of pickled foods, causes of hiccupping and other ancient medical knowledge. Dorin said the rare parchments showcase the sharing of knowledge that was happening among societies around the Mediterranean Sea during the Middle Ages, the historical period between the 5th and the 15th centuries. "Most people associate the Middle Ages with plague, war and ignorance," said Dorin, who is also an affiliated faculty member at the Taube Center for Jewish Studies. "We don't usually think about the dialogues between different cultures or open exchanges of knowledge that were happening throughout that time. These documents are evidence for the conversations occurring among people from different linguistic backgrounds." After more than a year of research, Dorin, with the help of other scholars around the world, determined that the pages came from two different texts. One was first written down in northern Africa sometime in the 14th century and ended up in Spain, where it was recycled as scrap parchment. The other was probably written around the same time on the island of Mallorca, a diverse hub of commerce in the western Mediterranean, Dorin said. Dorin believes that the knowledge the texts carry was passed down from the ancient Greeks. But many things about the artifacts are still unsolved. For example, it is unclear who wrote them or what other medical books the authors referenced during their creation. Back then, books were copied by hand and expensive to produce. "Hebrew manuscript fragments from that time are especially rare because so many of them were destroyed," Dorin said. 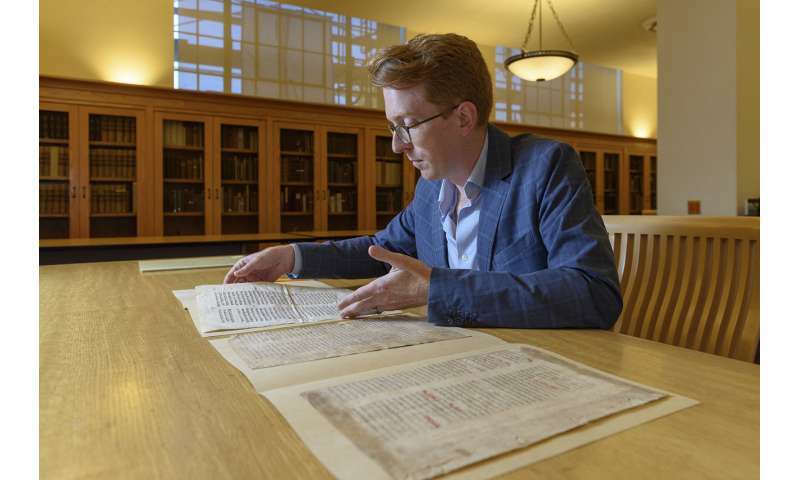 "Stanford's collections include hundreds of fragments from medieval Latin manuscripts, but to have something in Judaeo-Arabic is really special." The story behind the texts becomes even more complex because two of the pages contain faded text underneath the main text. X-ray imaging at Stanford University Libraries' preservation department revealed that the hidden writing is in Hebrew and is also about medical knowledge. Dorin said the hidden text could have been scraped off to make room for new text, as was often done during that time because parchment was expensive. But the faded passages could also have been an imprint of another text that was pressed tightly against the parchment. All three pieces of parchment were eventually used as covers for bindings of other books because of their durability. "We may never find out who originally wrote them," Dorin said. "But these texts provide a unique look at medieval multilingual communities. They were written for someone who could read Latin as well as Hebrew and Arabic, at least." This summer, Hagar Gal, a rising Stanford sophomore, is helping Dorin determine if any connection could be made between this text and other known Jewish, Arabic or Greek medical manuscripts from that time. "It feels like I'm trying to figure out a cool puzzle," Gal said. Gal said she was immediately captivated by the mysterious document after Dorin presented it to her and other students during a course on medieval history this past winter quarter. Gal, who was born in Israel and knows some Hebrew, picked up on the words "pickling" and "vinegarized" in the writing. "I was so excited to recognize words that were written so long ago," said Gal, adding that she has always enjoyed studying history. "It's pretty amazing to see how this one document captures the movement of knowledge throughout the Mediterranean and Africa and how languages come and go with time." All three pieces of parchment can be viewed in high resolution on the Stanford Libraries' website or in person at the Department of Special Collections, where they are now labeled as "Fragments of two medical treatises written in Judaeo-Arabic.